Richie Towell had to wait almost 100 days to get his Rotherham return, but he never wanted to end up anywhere else. The Millers were finally able to agree a return for the Brighton midfielder on loan deadline day following a pursuit that had started the day after he helped the club to League One promotion glory at Wembley. Towell had remained Paul Warne's number one target throughout and despite interest from elsewhere, the Irishman also had his heart set on coming back to South Yorkshire. “It took a lot longer than we thought it was going to to get done, but that's football,” Towell exclusively told the Star. “It got done and it was the best result for everyone that I came back to Rotherham, I wanted to come back and play at the highest level I could. “There was quite a lot of interest but especially after the year we had last year, he kept all the boys together, the gaffer was great with me, there was only one place I wanted to go and I wanted to test myself at Championship level as well and try achieve something good with a great group of lads. 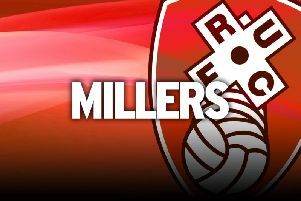 “There was a stage where I thought it might not happen but the club and Rotherham were working really, really hard and trying to pull out all of the stops to try and get the deal done so I am thankful it did get done. There is no doubt that Towell will feel wanted as not only did Warne let everyone know how he felt, the fans also made their opinion known, as they contacted him on social media insisting he re-signed. And the 27-year-old wants to repay that support. “For me I always wanted to come back and the fans wanted it,” he added. “It was an easy decision for me, the fans all like me and I hope I can have a successful season and they like me even more.